What's that just above the cross?! Beautiful house and amazing weather vane! Hey, finally a picture from the US! I love it! Great shot. And a lovely thing to photograph. You are very good. I don't know what the Mermaid House means, but it's a beautiful house! that's a lovely shot... the pale color of the sky makes it look like an ed hopper painting:)... and the house is beautiful! I'm guessing there are lots of good stories connected to this house. Almost looked like a country church when I first looked at it. For those who miss the connection between title and photo -- check out the weather vane. What a beautiful building! I'm assuming it's looking over the water? The whole scene just feels relaxing. I could just live there. A great house. another place I'd love to visit. If walls could talk. I love that photo, Beth. It's a beautiful house. What a beautiful house. You start to wonder about the people who lived in it; you wonder about their lives and who they are. 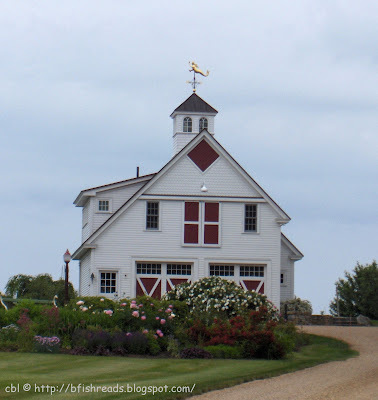 . .
Beautiful house - I love the weathervane and the lower floor shutters. My husband and I are heading to Maine this August for a short anniversary getaway, I can't wait! Summer Stock Sunday is up and running - come join the fun!